Doesn't this Tablecraft Products Classic Cake Stand with Cover look sensational? I've found the key to appetizing treats and meals is not the slaving in the kitchen for hours but to find delicious yet easy recipes AND always to present your creation beautifully. The key is in the presentation. Our Moms and Grandmas in their youth would display their freshly baked treats in glass covered cake stands on pedestals. You'd see a cake stand just like this Tablecraft item in restaurants and diners of yesteryear. This Tablecraft Classic Cake Stand recalls those elegant times. 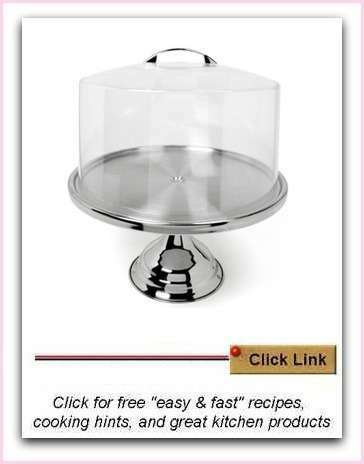 This classic cake stand is made of stainless steel with a tall roomy lightweight plastic lid with a stainless steel handle. It keeps your cakes, pies and pastries fresh and crunchy. In just about everything, whether it is presentation of your work at the office, or presenting a lovely meal, or presenting yourself to your friends, family and workmates, first impressions count. ...and presentation is the key. No matter how delicious your baked goodies, they must be displayed so that they're inviting and appetizing. So, go for a minimalist look that showcases and highlights but does not dominate your cooking creations. That's why I like modern, simple, classic table ware just like Tablecraft Products. Tablecraft items are elegant and use of modern materials results in a product that is lightweight and there is no concern about breaking or chipping a glass cover. If you like color, check out these other quality cake stand options from Le Creuset.